While we cloth diapered Leviah, we really didn’t explore a lot of different types of diapers and I’m still pretty clueless when it comes to all the ins & outs. I know Drew is comfortable with pockets and that’s pretty much what we stuck with. This time around I’m trying to clean up our ‘stash’. In other words, I’m trying to slip into the world of all natural fabrics. I’m drawn to the cotton, hemp, wool, bamboo, and particularly any of that paired with velour. So soft and appealing. Why aren’t there more velour underwear alternatives for adults? Anyway, I’m here to talk about our snack food. 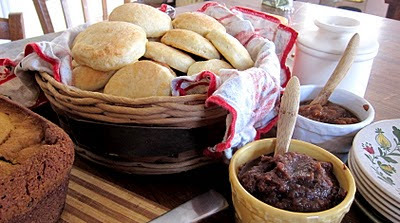 Biscuits topped with homemade apple or pumpkin butter. They were yeasty biscuits a-la the following ‘recipe’ from my mom. There are blanks you’re going to have to fill in with instinct, but I doubt anything would keep them from tasting delightful. Enough buttermilk to form a fairly solid ball–don’t over mix. Dissolve the yeast it warm water. So, cut the butter into the flour, salt and sugar. When that’s somewhat uniform in texture, add the egg and yeast mixture, then knead by knead the buttermilk. Ours took about 1/2 cup of buttermilk. Remember–don’t over mix.